I’m still working on coloring 50 copies of my Lettering Sampler print to sell on my website. I’m about three-quarters finished. The yellows, oranges, greens and blues are done, I’m working on the purples, still have to do pinks, reds and browns. I’m using mostly Hydrus liquid watercolors by Dr. Ph. Martin, though for the blues I went back to my old supply of Turquoise Blue from my DC Comics color set, as none of the Hydrus colors were quite right. I’ve had that bottle of color since at least 1987, and while many of the other colors were used up or dried up long ago, that one is still fine. In the picture above is my coloring brush, a #3 Winsor-Newton Series 7 Finest Sable, and as I’m only using one color at a time, the end cap from a mailing tube makes a dandy color holder. The one in there now is the pale purple seen in the word “plip”. Pulling out my old color set brought back a lot of memories of early days on staff at DC in the production department. I never did very much coloring, but to do any any all, you had to have a color set. This was a cigar-box with cardboard dividers that holds 40 small bottles of color. One is out to show, and next to it is a larger bottle for refilling and mixing colors at home. 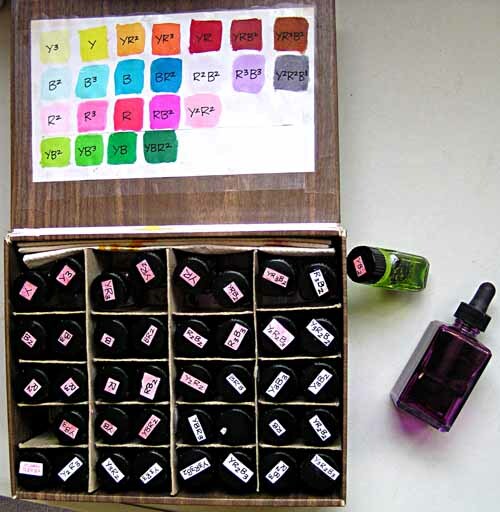 My color chart taped to the inside of the lid is of the colors I used most, and those bottles have pink labels. A little hard to read now, but I think you can get the idea. 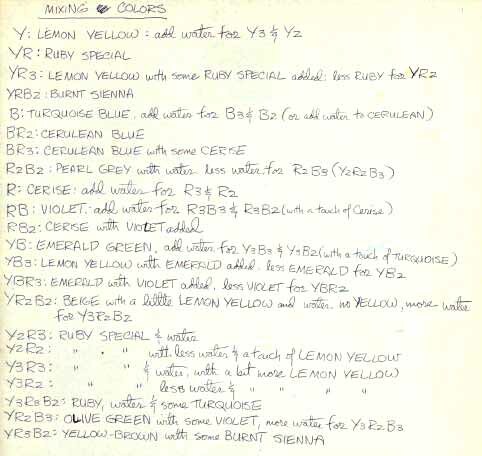 Some colors in the color set were right from stock, such as YRB2 = Burnt Sienna, but most were mixed from one or more original dyes. Red, as in Superman’s cape was YR, and used the dye Ruby Special, one made up for DC. As you can see, creating and maintaining a color set was a lot of work! And even if you did it well, the colors were only guides. None of your actual colors ever saw print. They were merely used as guides for the color separators, who followed them more or less closely (depending on the ability of the separator) to create the actual color masks using opaque paint on acetate, or rubylith film. One mask was created for each value of each color, so a single comics page in this system needed three blue masks, one each for 25%, 50% and 100%, and so on. The blue masks were combined photographically into one piece of film negative for the blue ink on that page. A very complex system, and one with lots of room for errors, of which there were many. And even when everything went perfectly, the poor quality of paper used at the time resulted in pretty poor results, as shown below. 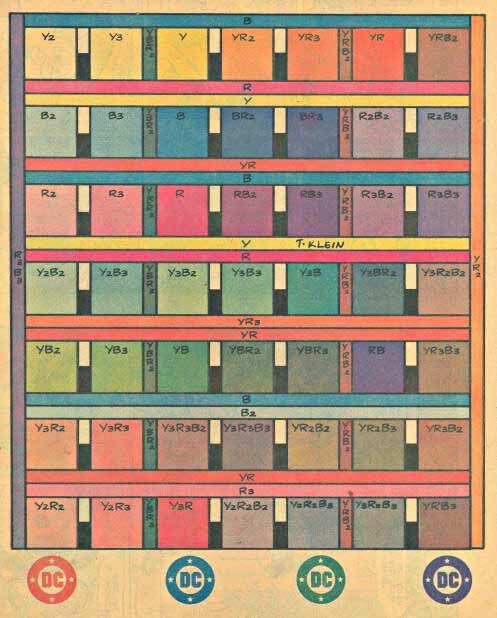 Here’s the same color chart as above, printed on newsprint. The paper has tanned with age, but even so I think you can see how badly the colors reproduced. I think the 1970s were probably the nadir of paper quality at DC. Comics from the 1940s and 50s had much better paper, and still look it today if well kept, but the company began cutting paper quality to save money some time after that, and when I started it was pretty awful. So, as you can see, any colors other than the primary ones were likely to come out mud. Now colorists working on better-quality paper, some of which came close to this example on inside pages for books like CAMELOT 3000, really had colors to play with! Still a limited palette, but much better than what they’d had before. Color would change again, and drastically, with the advent of computer coloring in the late 1980s, opening up a vast rainbow of choices, thousands and millions of shades available. Many of them are indistinguishable, but for computer colorists today there’s one great advantage: the colors they put onto their computer files are the ones actually used to print the comics. The labor-intensive process of hand-made separations is gone, and good riddance, I say! This entry was posted in Creating Comics, How To on February 3, 2008 by Todd. I enjoy your looks into the history of the production side of comics. I work at a small offset print shop and it is fun to see the similarities and differences between how things were done then and the work I do now. You do so many amazing posts here, Todd! I’ve really enjoyed everything you’ve put up, but this look back at how coloring used to be done is amazing! As an artist coming up now, I really appreciate how much work went into the comics I grew up on! Thank you very much for all of this insightful information! Thanks, Fnord, and you’re welcome, Rob. Just commenting to agree with Fnord and Rob. The historical posts are really fascinating, Todd. What a night and day difference between newsprint and bright white coated cover stock! I loved the photo of the cigar box color set. Those last two pictures illustrate perfectly why it drives me so crazy when Marvel prints their Masterworks on shiny white paper but uses the exact same colors as the originals, resulting in something far louder and more garish than originally intended. Great entry as always, but may I ask – and you’ve probably answered this before – why do you do a lot of your coloring on individual products by hand instead of just saving a colored copy and printing those out? Do you legitimately enjoy the process, is something lost in digital translation, or whatever? I think there’s more chance of selling a hand-colored print than there would be of trying to sell a printed copy in color. Plus, the cost of printing in color is so much higher I’d have to charge more to make it worthwhile to me. Plus, I do enjoy the coloring, and think it makes for a better product than any printing process I could afford. Marvel had a more limited palette than DC for many years. Most Marvel Comics you see from the late 1950s-early 1960s were in fact colored as garishly as possible. Every woman’s hair was 100% yellow, her dress was 100% Red 100% Yellow–the brightest of the reds, etc. Marvel also moved to the 75% screen in the 1970s. Viridian green was the lovely result. Well, Todd, thanks for making me feel extraordinarily old. I know the feeling, Mike. Good to hear from you. Poison Ivy: Yes, but the paper it was printed on muted the colors considerably. The effect was far, far less garish than the Masterworks editions. I see your point, Rob, but there aren’t any good alternatives for Marvel, as I see it. Recoloring the stories would be too expensive, and also change them so they’d no longer be true reprints. Using newsprint would mean the books would decay in a relatively short time, just like the comics. Their only option would be to use a paper that is not glossy and is somewhat absorbent, to soak in some of the ink, but the colors would still be much brighter than the original comics. Todd: DC’s recent Fourth World Omnibus editions are printed on high quality, non-glossy stock and the results are jaw-droppingly gorgeous. 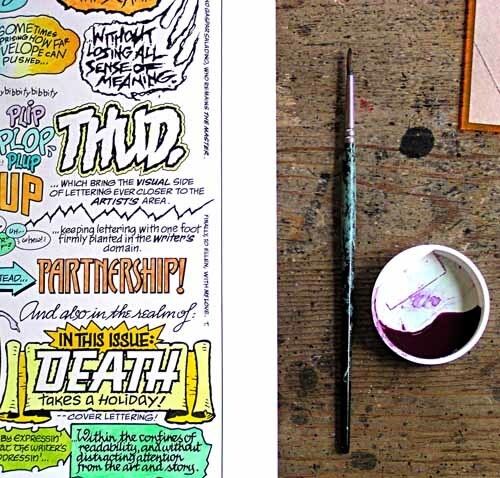 … but did Jack Adler actually permit you to color with a Winsor-Newton series 7 #3 brush. He routinely instructed colorists to work with a Winsor-Newton series 7 #7 brush, which layed down color at a much faster rate. And he made sure we used the bigger brushes from our first assignments. The series 7 #7 brushes still came to a super-fine point for small detail work, so they could even be used for full-process color assignments where our coloring was actually scanned, but they really did speed things up for conventional comic book assignments. I certainly enjoyed the better offset (as opposed to letterpress) printing and the better paper stocks, but found the higher-grade Baxter paper stock could have an overly-bright “Day-Glo” quality, so on books like THE SHADOW STRIKES I routinely traded in the 100% yellow, magenta and cyan tones for 10% and 24% K (for key plate, or black) tones. On THE SHADOW STRIKES, I desired a slightly muted, somewhat retro rotogravure quality that I felt better evoked the 1930s. I found dropping the 100% really worked on the brighter Baxter paper, which Adrienne Roy and I eventually also used when coding THE NEW TEEN TITANS Baxter series. Another thing worth mentioning is that Marvel colorists had one less color tone available during the Silver Age, while DC colorists lacked two. 1950s and 1960s Marvel books didn’t utilize the 50% yellow, while DC colorists weren’t permitted to use the 25% or 50% yellow tones. This severely limited the color palette available. (I suggest your readers scroll back up to your color charts and imagine dropping any lines of color that included the 25%, 50% or 75% yellow tones, coded Y2, Y3 & Y4.) Neal Adams successfully lobbied to use all three yellow values when he started coloring some of his own stories, which is why we finally saw Batman’s costume colored a dark gray (25%Y, 25%R, 50%B) rather than the earlier light purple (25%R, 25%B). When I colored three issues of Alan Moore & Steve Bissette’s 1963 for Image, I purposely restricted myself to the same colors (minus the 50% yellow) that Marvel colorists had available during the 1960s. And I did without either the 25% or 50% yellow for one of my last DC jobs, a retro story drawn in the 1950s style. (It was the first time I ever received royalties for my coloring, and ironically I was paid those royalties to make the stories look the way they had when Marvel colorists were earning something like $2 per page.) It’s really amazing what DC colorists like Jack Adler were able to accomplish during the Silver Age with a color palete that only utilized a 100% yellow. Thanks for you comments, Tony. You were there, and coloring at the time, and know a lot more about this subject than I do. As to brush size, I know most DC colorists used larger brushes to increase speed. I never did enough coloring for that to be an issue. Your look back into the “past” of comics coloring was quite edifying. Over the course of twelve years with Gladstone I did a fair amount of hand coloring myself, using World Color Press’ 64-color pallette and then Jamison Services’ ten-percent increment chart. One thing you didn’t mention was call-outs, in which the colorist writes the values of CMY right on the guide, drawing a line from that written value to the area where it appears. To say that this added labor to the process is putting it mildly, but it did put an extra level of control on the color that finally resulted. Coloring that way was, for me, sheer agony. I never got very facile with it, and like you I’m very glad to see it fade into history. By the way, the only full-blown story Gladstone ever published that was computer colored entirely in-house was William Van Horn’s Uncle Scrooge tale “Secrets”, which appeared in Gladstone’s final issue of Uncle Scrooge (#318). For nearly every other item that appeared inside a Gladstone comic, color guides ruled! Thanks, Gary. I thought of covering that, what we used to call “marking up” the colors for the separators, but decided I’d said enough. All colorists hated doing it, and usually saved it for the last minute, in the office, as the messenger was waiting impatiently to take the guides off to the separation house. Hello, Todd! A good friend of mine directed me to this post. Thanks so much for showing the process and the results on the old paper. What an eye-opener. I’ve only been digital my entire career, but I’d seen sample sheets of the YRB palettes, and for a brief time when DC took over Wildstorm, we worked on guides with the CMY callouts (which no one at Wildstorm FX liked AT ALL). What I’d never seen before were the bottles of ink. That’s awesome. Thanks again for sharing! Now I’m going to comb through your archives! Great post, Todd. And I also enjoyed Anthony Tollin’s contribution to the conversation. One question. I believe there actually were no true 25% and 75% screens at the time. Screens in those days were routinely manufactured in 10% increments, so the 25% value, when it was actually shot was 20% and the 75% was actually 70%. Not that anyone would notice. I asked about this once during my time at DC and I don’t remember now who confirmed it for me. On the other hand, I also heard stories that Chemical Color in Connecticut would sometimes under- or overexpose the printing negatives to save time from having to switch out the screens in the camera — so God only knows what actual value got plated. Anybody else hear about that 25%/20% discrepancy? Back in my old newspaper days, I used to hand-cut the (very basic!) colour seps using amber or ruby lith film. This stuff was on a clear carrier, and I would cut out the shape that was to be coloured, then indicate on an tissue overlay what percentage of the CMYK colour/s to be used. Do any of you older guys remember that fun stuff? Ah, colorists are coming out of the woodwork for this one! Thanks for your comments, all. I do recall there used to be a sort of “mine is bigger than yours” competition as to who could use the largest brushes for coloring back in the day, Gaff. Jerry Serpe also used very large brushes. Mark, we sometimes used rubylith for simple separations at DC. Later Murphy Anderson and his studio used them for 4-color separations on DC books. You can tell which ones they did because all the colors have sharply-defined edges, unlike the slightly softer edges created from opaque paint. Mike, I don’t recall anything about the screen percentages you asked about, but a 5% difference is negligible anyway. I think this conversation and the article that precedes it are further proof that you’re discussing subjects that are fascinating as well as unique. Thanks for once again giving all us laypeople a glance inside the machine! One more quick comment: Sometime around 1970, Chemical Color in Bridgeport Connecticut purchased new cameras which unfortunately used the same dot patterns for both the magenta/red and cyan/blue dot patterns. This was done over strong objections from DC’s resident color genius Jack Adler. Previous to this, the red and blue dot patterns were at different angles, which resulted in a consistent amount of white paper showing through. One might assume that the darkness of a printed color is directly representative of the size of the dot (25%, 50% or 70%) but it’s really dependent on how much white shows through between the dots. Once the red and blue plates were being printed at the same angle, there was no control over this. For example, a 50% blue dot could print directly on top of a 50% red dot (allowing a lot of white to show through) or the red dots could print between the blue dot patterns (resulting in less white and a much darker value). The levels of lightness and darkness became luck of the draw (depending on how the dot patterns aligned in printing) and were beyond the control of 1970s and 1980s colorists whose work was separated by Chemical Color. One point regarding the difference between a 20% dot and a 25% dot: It really did not matter when they were printing the books on the old letterpresses at Sparta. Nobody there was paying that close attention to dot sizes. Hey, Bob, good to hear from you! I well remember the press check you and I did for one of those books where only about the final 10% were what we wanted to see, maybe it was that one. Thanks for this detailing of the coloring process. I always wondered about this aspect of comic book production, and how it would sometimes look fantastic, and other times be disappointing. I always wished that the best examples would be noticed and emulated, especially after the move away from newsprint paper, and given the garish look of a lot of comics on Baxter paper. I thought the 1963 series was a great example of a retro look. I wish there were more of the same. But then again, I wish there were still candy bars for a nickel. I thought the reason for screens being at a standard angle to each other was to prevent moiré patterns from the relatively coarse screens. 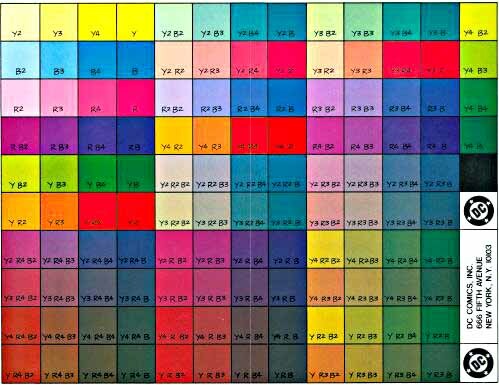 Because yellow is tonally much lighter than cyan or magenta (and because most printing favours the red plate – especialy if there’s a lot of magenta on the spreads on each printing plate) the 3rd colour plate was less of a (perceivable) moiré risk than the cyan or the magenta. When the 10% and 20% K-tones were introduced in the 80s this required a fine-tuning of the benday tones on the black/linework plate. This eventually needed a computerised separation with a much tighter screen. The finer screens made the colour mixes flatter and the filled areas generally more static. The eye was not having to work so hard to mix those Y2/R2 flesh tones from the little dots of yellow and red against a white background. I trained at Marvel UK in the early 80s doing hand-sepped pages with red oxide paint, jammy red markers and a pin bar for each of 9 separations on acetate. This was an excellent way of showing how the colour mixes worked. I learned that there was a means of optimising the seps by finding colour mixes that related to other areas on the body or the panel or the whole pge that used the same mix. A good example is The hulk where his skin is Y3/B3 and his trousers are usually R/B3 or later-on R3/B3. You could put B3 over the whole figure on the 50% Blue sep and only slightly less obvious shapes for the 100% Magenta and the 50% Yellow seps. I had heard that during the 70s Archie cut back by removing the Y3/50%Yellow screen which was definitely picked up by DC in the mid 70s. I cannot see a loss of any screen at Marvel – colours like the deep turquoise of Lorna Dane’s costume in X-Men 50-51 needed Y3/C and Y2/C3. Check out some of Tom Palmer’s colour over Adams and over Colan in Doctor Strange. This idea that a character like Sue Storm always had 100% Y used on her hair is incorrect – her hair was Y3 but her brother Johnny’s was Y. Tertiary colours like the Y2/R2/B2 greys and the Y2/B3/R2 darker grey (eg: Dr Dooms mask) and the more organic Y3/R2/B2 and Y3/R3/B2 used so much in the backgrounds of Sgt Fury and the westerns had been around since the monster-menace stories of 1959 – 62. I am currently coloring a comic (on computer) in a 70s retro style and the information in this post is invaluable! Thanks a lot, and I admire how much time and dedication went into coloring in the past. Todd, I went looking for the old color template to show a colorist on my new series and your blog came up right away. I have a lot of catching up to do! This entry brought me back to my first days at DC, soaking up everything the late, great Bob LeRose would teach me. One advantage of the “classic” method of coloring is that colorists were forced to be artists, not technicians. 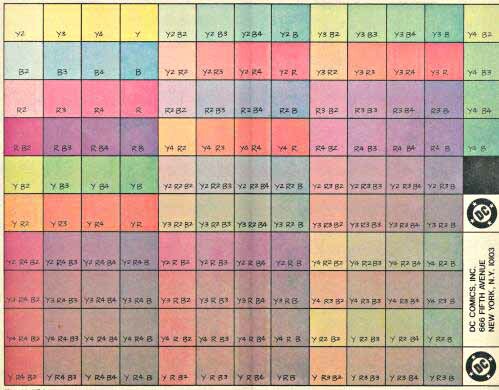 To this day, because of the color chart, I can look at any color anywhere and tell its CMYK components. Great at parties! per the particular comic book issue. That was a system used for a few years to help newsstands know when to remove older comics and replace them with newer ones. The idea was to color code a section of the top edge of the comics with primary ink colors: cyan, magenta and black (not sure if yellow was used). 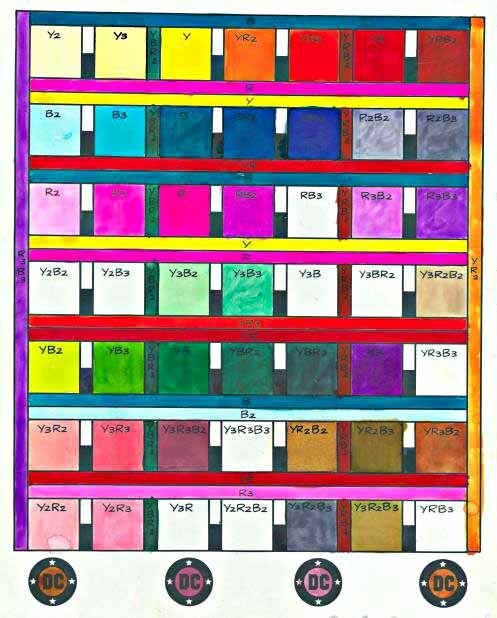 In theory, a seller could quickly identify all the comics from a particular month by these color bars. This has helped me so much with my visual study for my art class at school! Aything else you could suggest me looking at? I don’t know quite how this was helpful, but there is a part two for this article, and there are books about how to color comics.